COBRA is a Hamilton based collective of artists of color. It came to their attention that artists of color are under-represented, both at the grassroots and administrative levels; they seek to offer their perspective as the Hamilton Arts Community begins making strides towards a more complete understanding of the city's under-served artistic scenes. COBRA began its' work in 2016, and is comprised of members from diverse racial backgrounds who are engaged in several of the city's arts communities – from photographers and musicians to playwrights, visual artists and designers. They believe in, and value the potential of the creatives of colour in the community, and strive to provide them with the access to tools and resources that are otherwise seemingly impervious. Thus, they would appreciate the opportunity to open a dialogue with organizations in the city. Their hope is that by starting to have this conversation, they can ensure that Hamilton's rich and vibrant art scenes reflects all of the city's communities as they continue to flourish and mature. 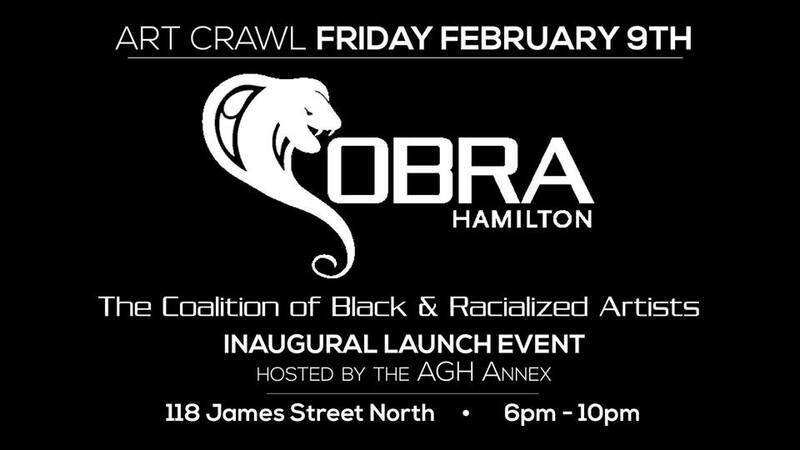 On Friday February 9th at the Design Annex on James Street South (in Hamilton) COBRA is hosting its inaugural launch party. The Facebook event page is here. The official launch will begin with an introduction to COBRA and its members, followed by feature performances by Canadian Winter, Shanika Maria, Nasr Beny, Hamilton YouthPoets, performance art -Truth Booth by artist Kiera Boult, photo exhibit by George Qua-Enoo, and textile and visual art by Hitoko Okada. I first heard about COBRA last year when I interviewed Stylo Starr (you can read that interview here). I interviewed some COBRA members (including Stylo) to find out their stories and their hopes for what COBRA will achieve. Kobi arrived in Hamilton in 2008 and knew very few people outside his family, and making art in the city afforded him experiences and opportunities in the city that he might not have had otherwise. He became involved in COBRA through Kojo Damptey, his frequent musical collaborator. He hopes that the work being done at COBRA will be an avenue for other artists of colour (whether they are from here or came here later in life) who want to create in the city, to find like minded people. He says that Hip-hop in Hamilton (like in most places) has a bunch of preconceived notions attached to it. Over the years, he's heard about venues who make it their policy to have patrons at events over zealously searched, or promoters who feel less inclined to pay decent money to acts, simply because there isn't a wider community to call them out for it. He thinks there is also a need for the taste-makers in the city to make an effort to understand art that falls outside their immediate comfort zone, rather than sticking to the familiar. In his opinion, it is actions like that which stifle diversity, and discourage artists from believing that there is a place for their work. When asked what one actionable thing that communities can do to increase representation, he said "As simple as it sounds - it all starts with talking. Sit down as a group and figure out where you want to go. Don't be afraid to look for other groups who are going through the same things as you, either. Change doesn't happen overnight, and if you can give yourself firm direction before you even start dealing with outside entities, then there is less likelihood of having your voice drowned out, when it's time to speak up". Eman became involved with COBRA when she attended the “I am an artist” event hosted by the Hamilton Arts Council in December. George Qua-Enoo introduced himself to her, her sister, and her friend and told her about COBRA and what it stands for. Eman is a minority but a fair-skinned minority, which means she has almost as much privilege as a non-minority. That said, her race hasn’t really affected how her work has been viewed, but her religion has. She's aware that they’re not the same thing, but the fact that her race is a minority and she's noticeably a member of a different religion has set her back further than other artists. She explains that when you’re a member of a visible minority, people expect your artwork to be centred around that characteristic, they expect to see aspects of your race and religion portrayed in your work because that’s what sets you apart from other artists. However, if your work lacks those characteristics you will find that you receive less support because your work is not “different” or “foreign” enough. The struggle to create artwork that is enjoyable for you but exquisite to others is a difficult one to balance, and often one that only artists of other races face. Growing up in a fairly suburban white city (not Hamilton), with a small percentage of minorities, she was never involved in anything her community did. She says she didn’t relate to the activities provided by the city or community because she felt that they catered more towards Caucasians. She never thought it was a big deal to not be involved in anything until she got older and realized how important it is to make connections. By then it was too late to get to know the people she should have been building a relationship with, like mentors and coaches. As a result, her experience of getting a job or of volunteering in community events has been a difficult one to navigate. When asked what one actionable thing that communities can do to increase representation, she said "So in my opinion, one actionable thing communities can do to increase representation is to create organizations specifically for those who want to be represented. Organizations like COBRA is a prime example of a representation-focused movement, and one that is much needed. When you cater to those who are left out you acknowledge that they are underprivileged and propose to change that. It helps them feel motivated to continue following their passions, meet great people and experience things they otherwise wouldn’t experience." Shanika got involved with COBRA two years ago. She was invited to a meet up by one of the other members. She was excited to talk with likeminded individuals who would understand the struggles of being an artist of colour in Hamilton/Canada. It was also a place where she was able to collaborate with these likeminded individuals. Being a part of this collective has been a rewarding experience for her. Shanika thinks that she's often misrepresented or othered in spaces, especially as an artist and that sometimes people can be clouded by stereotypes and believe black women only represent certain types of music. She's often the only person of colour on a bill or in the spaces where she performs. When asked what one actionable thing that communities can do to increase representation, she said "Representation is not going to change, unless marginalized individuals are on the decision making teams for these events. There are capable, talented marginalized individuals. Talk to us, support our work, and come to our events. These events are necessary as safe spaces for marginalized groups who often feel uncomfortable in white spaces due to constant othering, misrepresentation and tokenizing. If you decide to work with us, give us the same respect you'd give any other artist. Don't assume, have a conversation with us." 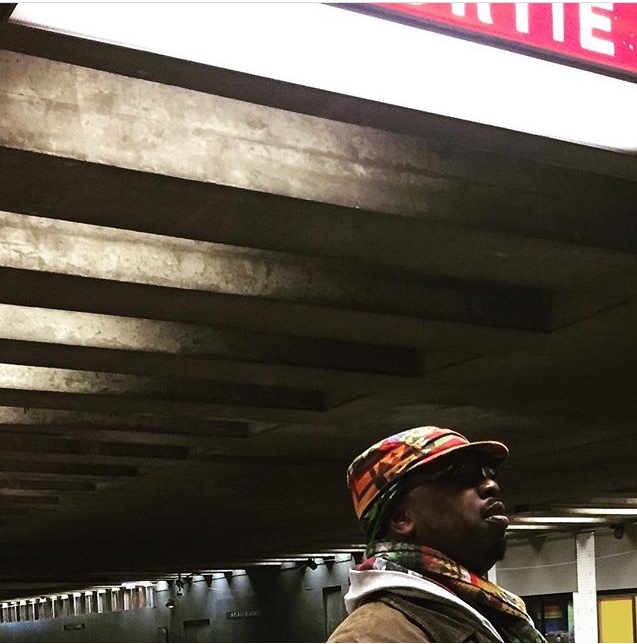 In 2016, Stylo, along with local singer and activist Kojo Easy Damptey rallied with other local singers, artists, photographers and playwrights to begin conceptualizing ways to connect and communicate with the leading establishments that lead and shape the Hamilton art community. The goal is to increase visibility and accessibility in the city on all levels of creative expression; they have quite a bit to offer. COBRA started with a group of local creatives of colour that all felt and experienced a common struggle in gaining exposure and visibility in the Hamilton arts community. They had all been steadily building their careers and felt they could use what clout they had already garnered to help direct more attention in the direction of newer creatives of colour that felt the same struggles twofold. Race has always been an integral part of how, and what Stylo creates. Being in art school where there was always a heavy focus on Western European art (both historic and contemporary) left her always feeling it necessary to comment on her experience through visual expression. This, of course, would often result in a lack of viewership or alienation; no one knew how to digest her work. She thinks now that there is more of an open space for dialogue within communities, especially with the evolution of social media, viewers have more faculties to explore and interpret what they see. COBRA seeks to participate in that dialogue, and introduce new avenues for viewers of Hamilton, and beyond, to explore. When asked what one actionable thing that communities can do to increase representation, she said "I believe in the two-part commitment of showing up and listening. Come to the events to show support; and listen to what is being shared. Public exhibition space, for any artist in any media, is sacred. It is here that we show our inner workings based on a mixture of heritage, and lived experience. For marginalized artists, our experiences lived through race are often a visceral part of expression. In being present and listening, providing that visibility -- these are then where the tools for allyship can be found." Are you a creative of colour? Are there any organizations like COBRA in your city? I'd love to hear about your experiences. If you liked this post, please comment, like, and share.